New Delhi, May 10 (PTI) Chief coach Anil Kumble's fresh contract will be up for discussion after Indian cricket team's Champions Trophy assignment in England. Kumble, who replaced Ravi Shastri (Team Director) last year as the chief coach before the tour of West Indies, was given a one-year contract till end of June 2017. "Yes, Anil Kumble's contract as the chief coach will end with India's campaign in the Champions Trophy. Obviously, there is every possibility that it will be up for renewal but that will only be decided by the general body after the tournament gets over," a senior BCCI functionary told PTI. Batting coach Sanjay Bangar and fielding coach R Sridhar have also been retained for the Champions Trophy. It was also learnt that any decision regarding Kumble's appointment will need to be vetted by the Committee of Administrators (COA). "Till the time COA is in charge of BCCI functioning, every matter will need its approval. 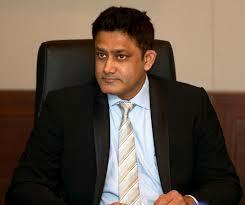 Whatever decision is taken regarding Anil Kumble, it will be have to be cleared by the COA," the source said. Since taking charge of the national team, India have won five back to-back Test series. In the 17 Tests that India played during the 2016-17 season, they won 12 under Kumble's guidance. The only defeat came against Australia on a vicious turner at Pune. India won 2-0 against the West Indies in the Caribbean followed by 3-0 win against New Zealand, 4-0 against England, 1-0 against Bangladesh and 2-1 against Australia. In the two ODI series that were played in India, hosts beat New Zealand 3-2 and England 2-1 respectively. In terms of performance, Kumble has had a good time in his new role. Kumble is also the man who has been entrusted with the task of making a presentation to the COA about what is kind of central retainership that Indian men's team should be getting. Meanwhile, it has also been learnt that most of the state associations have spoken to COA chief Vinod Rai during their recent meeting in Delhi about the practical difficulties of having only three national selectors. "We told Mr Rai that during the domestic season when there are close to 30 teams playing Ranji Trophy, it is difficult to have only three selectors. He has heard our case and he will give it a thought," the source added.